First go to the Offering Module and the Contribution List tab. Then select your date range. 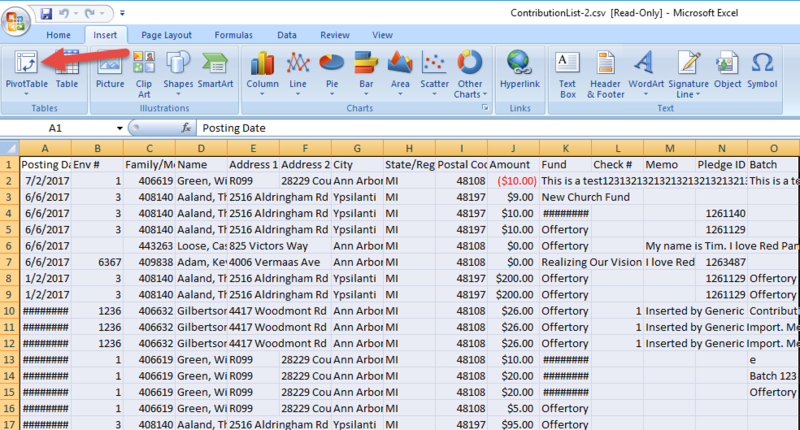 Click View Contributions to generate the results, then Export to CSV A to export the data to excel. In Excel highlight your data and choose Pivot Table from the Insert tab. In the PivotTable Field List on the right put Pledge ID under Column Labels, Fund under Row Lables, and Amount under Values. DFS Administration: How do I add a Celebrant for Sacrament Records?